For the past decade, Audra Weaser’s work has focused on nature. Her interests are in creating physically charged images reminiscent of watery landscapes. These abstracted scenes are formed from rhythmic manipulations of pigmented materials. 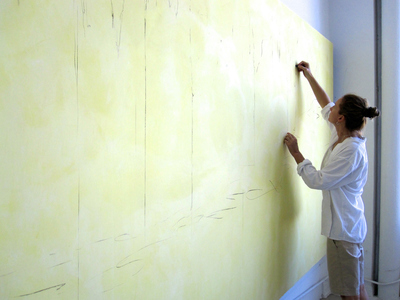 Her process includes building layers of color to form intuitive, organic compositions. Through a sanding process, she navigates back into the surface. In this excavation, an image of motion and presence emerge from a white expansion. They invoke images such as swampy bayous, mystical forests, or light shining in from gathering weather. They are an essence of what is unseen and translated into a visual and poetic experience. Weaser was raised in Southern California and lives and works in Los Angeles. She earned her M.F.A in painting from Claremont Graduate University. She has shown widely in Los Angeles and has exhibited nationally and abroad. Her work is in private and public collections in cities around the world such as Hong Kong, Abu Dhabi and Singapore.